First, start by measuring the pillow on the fabric cut length and not on the side of the cushion.
. It will be difficult to get a clear measurement on the side of your pillow after it has already been filled, so by measuring on the fabric cut length you can get a more accurate measurement of the size of your pillow. 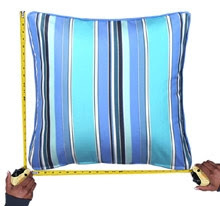 Make sure to measure your current throw pillow in half-inch increments.
. Example: A pillow that measures 19 7 / 8 inches should be rounded up to 20 inches or rounded down to 19 1 / 2 inches. .
Poly fiber is loose fill that is blown into the pillow.
. The pillow is then sewn shut. Poly bun uses a pre-stuffed inner pillow which is encased in a polyester unit.
. This type of pillow comes with a hidden zipper and has the option of being able to remove the inner pillow so you can easily clean the outer fabric shell. If you decide to enhance the look of your pillow, we offer assorted cotton, polyester and acrylic tassels, braids and fringes. Both the fringe and braided edges are attached to the pillows over the seams, along the edge of the pillow. Since all throw pillows are custom made, you can order any size and any fabric. We have a strong selection of fabrics to choose from including high end outdoor fabrics that are beautiful enough to use indoors.
. We even accept customer owned material if you don't find exactly what you want.